Last week we shared a new, acoustic track from The Smoking Flowers – “(Still) Here For You Now,” a companion piece to “Here For You Now” from last year’s Let’s Die Together. We sent the track – from an upcoming, stripped-down LP due this summer – as the band embarked on a weekend jaunt to some cities in the MidWest, including Milwaukee. While the duo was there, they stopped by the studios of WMSE to perform on The Chickenshack with Jonny Z. The band’s sound was a perfect match for the Chickenshack’s playlist, which features “real” country music “from the 30s, 40s, and the heartbreak 50s to the latest crop of resurgent bands.” Fans should definitely hear the whole show, which is archived and available to stream here. 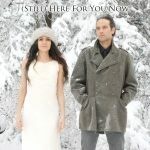 “(Still) Here For You Now” on our download page and get it spinning!